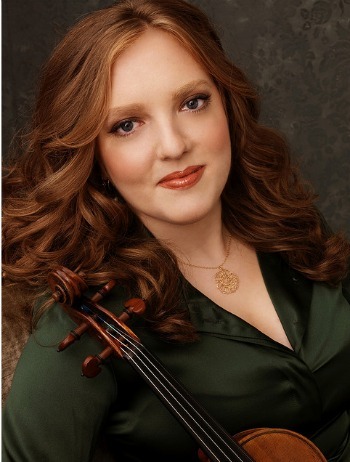 This time it was Rachel Barton Pine, who had to spend the night with her husband and four-year-old daughter at the airport because U.S. Airways could not accommodate her 1742 Guarneri del Gesú violin. "Well it was bound to be my turn eventually," Rachel posted on Facebook and Twitter late last night. "@USAirways wouldn't fit the del Gesú overheard so I had to exit the flight ... without suitcases." Pine had been in Phoenix for a Cremona violin exhibit at the Musical Instrument Museum, and before that in Flagstaff, Ariz. to play the Brahms Concerto with the Flagstaff Symphony Orchestra and to do some educational outreach. We're still trying to confirm if the incident occurred at the Phoenix airport. "Hang-ups at check-in and security resulted in our boarding after many others had already filled bins," Rachel posted late Sunday. "The bins were not stuffed, and many people had their handbags overhead instead of under their seats. There would have been plenty of room with a little rearranging, but they refused to do so, despite the fact that we assured them we had done it many times, and despite the fact that all three of us (including the 4-year-old) are Executive Platinum fliers (100,000 miles). The biggest annoyance is that they wouldn't unload our checked luggage so we could have what we need for resting at a hotel." The good news is that they did get on the plane following morning: "Happy to report my violin and family and I are comfortably boarded and will land in Chicago in 3 hours," she posted early Monday. "Thanks for your support everyone!" Even with rules passed earlier this year by the U.S. Transportation Department that officially require airlines to allow small instruments on plane, these incidents are still occurring. Part of the problem is the allocation of space; though the airline can't ask you to remove your instrument once it's been stowed, they also are not officially obliged to accommodate the instrument if you board later than others and there is no room left. Though they can't charge passengers an extra fee for carrying an instrument onboard, they can and do charge extra fees for boarding early. Just last week, Air Canada announced a 50% discount for any customers who wish to purchase a seat to accommodate a musical instrument.. That seems like a step in the right direction, but it looks like we have many steps to go. UPDATE: Just heard from Rachel. Yes, she was at the Phoenix airport. 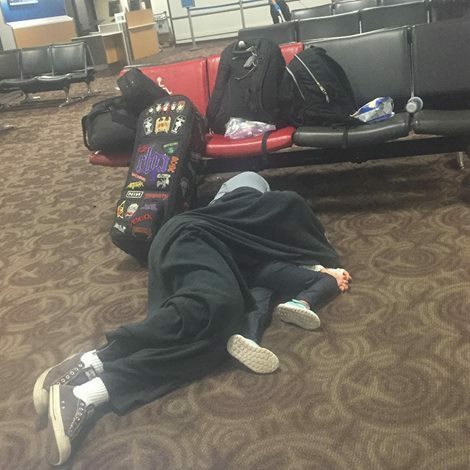 Also, it sounds like she simply stay up all night: "...my husband and I could not both sleep at the airport because someone had to keep an eye on the violin and other carry-ons. Knowing he'd have a full day at the office with his 20 employees upon our return, I decided to let him rest while I caught up on paperwork and correspondence for my foundation." Some interesting stickers/patches on that violin case. Is Ms. Pine a metalhead? Indeed she is, Paul (I'm not joking)! She has her own metal band called Earthen Grave, as a matter of fact! She couldn't help herself though. Had to quote K2. Airlines have gotten out of control, too much power to say the least, so sorry to hear that. I hear David Garrett had the same thing happen to him on a flight recently. The Kreutzer elude quote is already in the famous Van Halen guitar solo, because practiced violin music to improve his chops! Traveling in general—with or without an instrument—ceased to be a pleasure decades ago. Especially flying is a huge pain these days. I wish I were faced with the risk of lugging a genuine Guarneri instead of my serendipitously wonderful-sounding Chinese copy thereof (by that I mean that it turned out to be far better than I had any right to expect given its low-four-figure price). However, even for this copy I'd be happy to pay for an extra seat at a 50% discount or any other such reasonable option. I'm surprised that the insurance company they underwrites Ms. Barton-Pine's policy for her Guarneri does not require some stricter extra protection along those lines. Re metalheads: I thought the sticker/patches on her violin case were part of a ploy to tone down the appearance of its valuable contents. :) Like my disgusing my camera bags and violin case as diaper bags and such. I met Rachel and her husband recently, and they are both really great people! Very sorry to hear of their mishap. Also, in many cases, a 4 year old won't be as accommodating sleeping in an airport. Recently on my last few flights, I've grabbed 2 blankets from the overhead bin, wrap the violin in one, fitting most, sometimes all of it under the seat in front of me, and then use the other blanket to stay warm on those frigid flights from Florida, with my violin concealed from the flight attendant ;). I haven't had a problem yet, and am definitely not apt to ask permission when I'm boarding with group 4 or 5. Glad things worked out for the 3 people and 1 very special violin. And, while I am certain her capabilities extend from classical beyond even to metal, even, would it be not more likely Ms. Pine was playing the Brahms Concerto (Violin) rather than one of the four "Symphony"(ies)? As a native Phoenician and travelling musician, Id know thst brown, airplane covered carpet anywhere. She was stuck at Phoenix Sky harbor terminal 4. What a shame. Could she have taken the violin out of the case, and gate-check the case, and held the violin on her lap throughout the flight? It's a pain, but not as much pain as being delayed for 6 hours and sleeping on the airport floor. The only reason people hold babies in their laps on flights is because you can't put them in a violin case! Holding an instrument, out of its case, through a flight has to be terribly unsafe, what with turbulence, coffee being passed across from the aisles, etc. Glad it all worked out for the family but I am curious about one thing- she says they would not unload their checked baggage. But my understanding is that if they got off the plane, the airline MUST remove there baggage as they are not allowed bags with no passenger due to the obvious dangers of possibility of explosives in the bags?? Well it's instructive to know that we're still at the mercy of the individual flight crews regarding whether or not they'll carry our instruments! ...and someone stole Greg's socks.